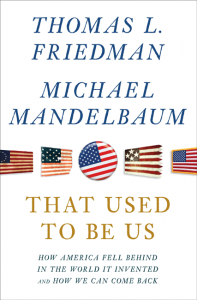 That Used to Be Us: How America Fell Behind in the World It Invented and How We Can Come Back By Thomas Friedman and Michael Mandelbaum, New York: Farrer, Straus, and Giroux, 2011. Xiv, 380 pp. Thomas Friedman is a three-time Pulitzer-prize winning New York Times columnist, and the author of five best-selling books. Michael Mandelbaum is professor and director of American Foreign Policy at The Johns Hopkins University School of Advanced International Studies, and author or coauthor of 12 books. The thesis of this book is that the United States created a climate of education, innovation, and opportunity that made it the world leader that is was through much of the 20th century. But by falling behind in education and losing its optimistic stance, America is rapidly losing that lead and must make some dramatic changes to regain it. There is hope, however, both because of opportunity (through world changes driven by technology) and problems facing the world (climate change) where America could step up in a bold way. To do this would require America to address policy changes that would put more emphasis on education, address infrastructure issues, and face climate change realistically. Individuals also need to step up to recognize what it takes to succeed in this new 21st century world. They must take responsibility for their careers in a new way and not be distracted by successes of the past. The challenge of getting a good education, particularly in math and science, amidst the distraction of our media age, must be faced family by family, person by person. Readers familiar with Friedman’s other books will immediately recognize both his style (enthusiastic, fast paced, lots of personal illustrations, wordy) and the content. There are lengthy summaries of his previous works on how technology is reshaping the world (from The World Is Flat) and the impact and opportunities of climate change (from Hot, Flat, and Crowded). Like the other books (particularly The Lexus and the Olive Tree) we also go with Friedman on his jaunts around the world, meeting people from all over the globe. 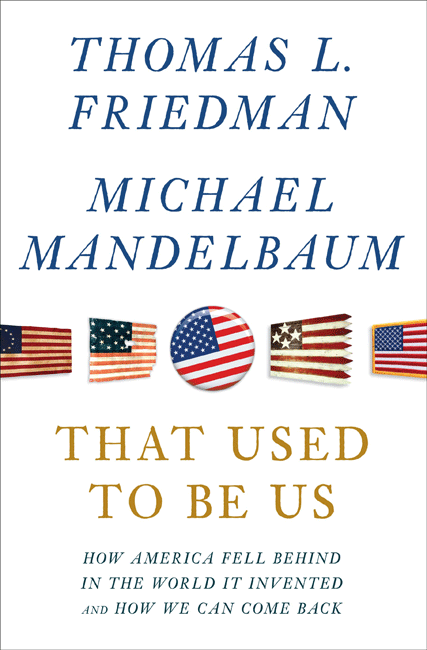 What Mandelbaum seems to bring to this book is more focused thought on what all of this has to do with policy issues, both foreign and domestic. The authors have found a way to handle joint authorship combined with lots of personal anecdotes (mostly from Friedman it seemed, though I didn’t count them) by giving the anecdotes in the third person (“When Tom was in Bangalore he …”). I found this very readable and effective. This book is easy to criticize. Some won’t like the political orientation of the authors (probably slightly left of center), the wordiness of the book, or the repetition with previous books. But I found this to be an important challenge particularly for those who are early in their careers, to think about their own need for continuous learning and change. The final chapter was sobering. The authors were asked if the book has a good ending, and they basically concluded it is up to us to write that ending.